ADGM buiding front. Image used for illustrative purpose. Three quarters (75 percent) of regional investment professionals expect more money from foreign investors to pour into locally-domiciled funds over the next five years, according to a new study. United States-based financial services firm State Street’s 2018 Middle East and North Africa Regional Survey found that 14 percent of professionals felt that foreign investment into funds domiciled in Gulf Cooperation Council (GCC) countries would increase by 20 percent or more, while 24 percent felt it would increase by 10-20 percent and 37 percent expected an increase of under 10 percent. 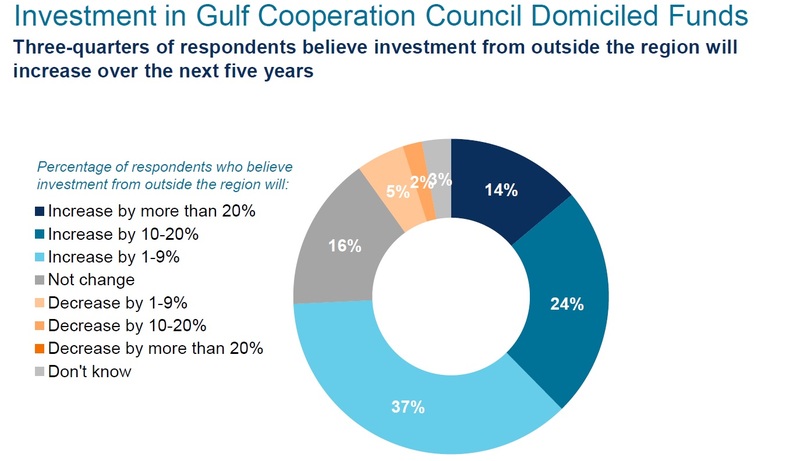 Only 7 percent of respondents thought foreign allocations into GCC funds would decline. The survey covered 306 investment professionals representing sovereign funds, central banks, asset managers and pension funds from around the region, State Street said. Emmanuel Laurina, senior executive officer for State Street Global Advisors, said that while the market for locally-domiciled funds is currently "pretty limited", it is an area that is attracting more attention. "What we're seeing is a lot of interest on the part of investors - institutional and wealth, by the way - for more cost-effective investment solutions that are focused on GCC assets," he told Zawya in a telephone interview on Monday. "If you think of all the debt issuance that has been taking place (around the region) we're starting to see a good case for perhaps harnessing those assets in a more disciplined, risk-controlled, benchmark-aware type of approach," Laurina said, while also pointing out the opportunity that the addition of Saudi Arabian stocks onto emerging market indices compiled by FTSE Russell and MSCI next year would bring for new product lines to be developed. He said that although index upgrades for local markets would automatically bring in global flows from index-linked funds, it also presents opportunities for more structured products targeting local investors. "When you look at who owns the majority of Saudi stocks, or GCC stocks and bonds, a significant portion of those bonds and equities are owned by local institutional investors, not asset managers. He said that as institutions review investment policies based on market changes - including using passive funds either for hedging or interim exposure purposes – this could trigger demand for more locally-based funds catering to local investors. Dubai International Financial Centre said on Sunday that there are over 60 funds domiciled within its centre, whereas Abu Dhabi Global Markets told Zawya it has 13 locally-domiciled funds. Thomson Reuters data indicates that there are currently 398 GCC-domiciled funds, 280 of which are based in Saudi Arabia. According to State Street's survey, 59 percent of investment professionals expect capital markets growth across the MENA region over the next five years - 22 percent said they were "very optimistic" - and 64 percent said they expect overall economic growth in the region. Respondents were generally more enthusiastic about their own organisations' prospects, with 78 percent expecting 'robust, sustainable growth'. In terms of targeted asset classes, 44 percent of respondents said they expected to add emerging market equities to diversify their portfolio, while 41 percent expect to add fixed income investments from developed markets (31 percent expected to invest in emerging markets bonds). Boston-based State Street also announced yesterday that it has opened a new office within Abu Dhabi Global Markets after opening its Dubai International Financial Centre base earlier this year. Laurina said that although it has had a representative office in the UAE for 26 years, the decision to open bases within Dubai and Abu Dhabi's main offshore finance hubs reflected the firm's desire for a bigger presence in the region. "We just reached a point where that structure no longer lent itself to our growth ambitions in terms of staffing, in terms of things we want to do relative to what our licence allowed us to do," Laurina said, adding that it now has 35 staff in the UAE. The new Abu Dhabi office will contain a regional base for State Street's banking operations, which offers global custody, securities lending and other services.